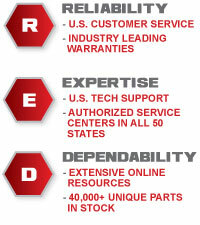 At JET not only do we warranty every product we develop, but we assure that our after sale service and support is #1. Our customer-rated 9 out of 10 Customer Service, Technical Support, 40,000+ unique parts in stock, and leading warranties guarantee we have the industry’s most dependable service and support program. If a JET tool needs service or repair, one of 750 Authorized Service Centers located in all 50 states can assist you. In most cases Authorized Service Centers can perform a warranty repair, assist in obtaining replacement parts, perform routine maintenance, and perform a major repair on your JET Tool. For the name and location of an Authorized Service Center in your area call 1 (800) 274-6848 or click on the Service Center link. From here forward, look for our JET RED Assurance stamp. When you see this logo you can rest assured that behind every product is decades of reliability, expertise, and dependability.